Catholic Religious Education (CRE) is most important at the time when a student is preparing for a Catholic Baptism, First Communion (the first reception of the Catholic Eucharist) and Catholic Confirmation. It has to be a way of life: the things we learn, the things we read, the things we think, and the things we do. Generally we need Roman Catholic books to bolster our Religion course so it is good to teach the saints and Bible stories that match the topic of the day. This can sparkle up the class since these can be so interesting. Do you have students who could use help learning the prayers or the answers to the catechism questions? 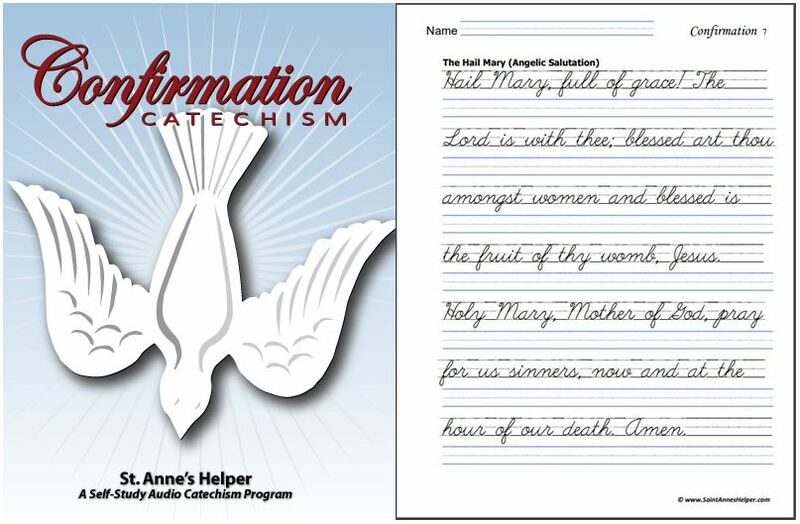 We recommend using St. Anne's Helper Audio Baltimore Catechism, Catholic worksheets and lives of the saints to be certain of the truth and to gain a "sense of the Faith". Use these as an easy basis for your classes or as supplementary review. These are the main things to learn. Be sure to allow the children the time to learn them in your Catholic religious education course. The better you yourself learn these truths, the easier it will be to keep the Faith and to teach the Faith. I remember years ago having had a conversation with a lady who had helped sisters teach during the 1950s. She said that the Sisters used to teach the basics of the whole catechism every year. Why? They taught the basics every year just in case a child only had that one year in a catechism class. That way, each child had the basics necessary for a life time, and those who were fortunate enough to have many years of Catholic religious education learned the beliefs well and had time to study them in more depth. For those who must prepare for a sacrament in only one semester, it is good to go over these four basics and then add the truths that are specific to that sacrament adding in the appropriate saints and Bible stories as the catechism questions relate to them. Use St. John the Baptist with Baptism, St. Pius X for Communion (he allowed small children to receive Communion), St. John Nepumocene for Penance, and the story of Pentecost for Confirmation, etc. A good Catholic religious education program teaches what all Catholics need to know, love, and serve God in their daily lives. St. Anne's Helper Baltimore Catechism teaches the Roman Catholic beliefs as taught in the Baltimore Catechism No. 1, especially those for Baptism, Penance, and First Communion. 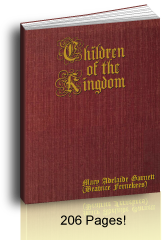 The Baltimore Catechism for children and the Adult Baltimore Catechism versions both offer a concise presentation of the basic Catholic beliefs. RCIA students are frequently already baptized, yet a review of the sacrament of Baptism is included in the First Communion preparation which makes a great Volume 1 for adults - especially the audio downloads for passive review. 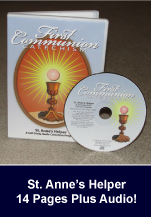 Adult Catholics and converts will be happy to find that the basics for Catholic Baptism, Catholic Reconciliation and the Catholic Eucharist are all included in the St. Anne's Helper First Communion preparation. There is some review of these sacraments in the St. Anne's Helper Confirmation preparation with the additional questions and answers that apply to the Holy Ghost, the Blessed Trinity, and the sacrament of Confirmation. These questions and answers are available as verbatim versions of the text that accompanies the audio files as Catholic worksheets or Catechism Copybooks for First Communion and Confirmation (free pdf samples). You can print Catholic Religious Education worksheets any time you need them for as many students as you are teaching, even through the years. This is especially helpful for those who are using a Catholic home school curriculum, like Our Lady of Victory Home School, Mother of Divine Grace, and Seton Home Study School as they all use the Baltimore Catechism. These make great homeschool worksheets that can be available any time without having to be online. These also make great handwriting practice worksheets. You or your Catholic Religious Education department can print our worksheets at any time to give your students practice writing the Baltimore answers. Keep the download handy through the years. No need to buy other consumable booklets or workbooks again and again. See our order page for our selection of religious education downloads. 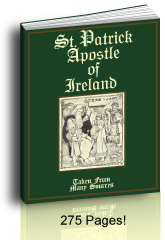 The St. Anne's Helper Audio Baltimore Catechism program covers the questions normally learned about the sacrament of Baptism including Original Sin, mostly in the First Communion volume and the definition is reiterated in the Confirmation volume. The Baltimore Catechism Baltimore Catechism No. 0 and Baltimore Catechsim No. 1 cover the basics for First Confession (Catholic Reconciliation) and First Communion. The sacrament of Penance is usually studied just before First Communion which makes sense since, by making a good Confession, one's soul is that much more pure for the reception of Holy Communion. The Blessed Sacrament IS Our Lord Jesus Christ! So we want to be well disposed to receive Him well, especially for First Communion. The basic Catholic beliefs for Confession are found on St. Anne's First Communion Catechisms (Audio Clips or Copybook Sample Pages). These cover the sacrament of Penance, Original sin, and the Catholic Ten Commandments in depth. The Baltimore Catechism No. 0 and Baltimore Catechism No. 1 cover the basic Roman Catholic beliefs for Baptism, Penance and the Catholic Eucharist. 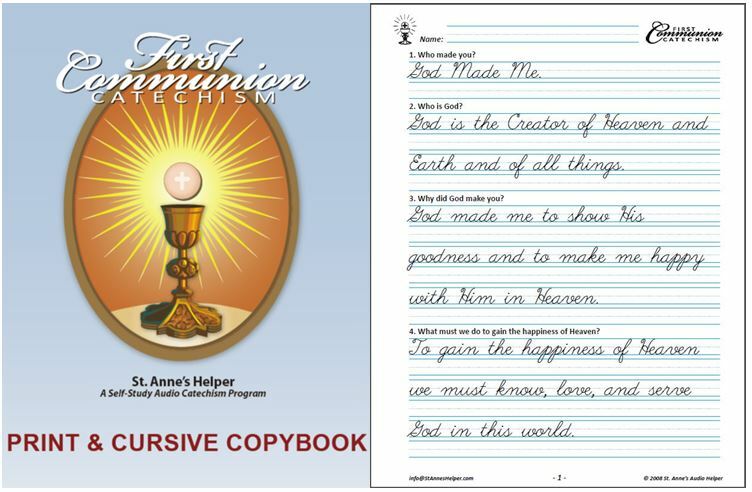 St. Anne's Catechism Copybooks make excellent Catholic worksheets for Catholic religious education First Communion courses. These same Catholic answers are true for any age so they're also good for adults. Cradle Catholics begin their study early at about 6 or 7 years old in order to prepare for First Communion. The course work covers Baptism as well, yet usually doesn't cover much about Confirmation until the Baltimore Catechism No. 2 and Baltimore Catechism No. 3. An adult catechumen usually studies for all three (Baptism, Confirmation, Holy Eucharist) since he is usually able to receive his First Communion and Confirmation on the very day of his Baptism! A new adult catechumen would want to own both the First Communion and Confirmation Audio Catechism CDs to have the basic Catholic beliefs for the first four sacraments. Otherwise, one catechism book will cover the information in all of the above. We recommend the Catechism Explained and the Catechism of the Council of Trent. It is also helpful to study the Roman Catholic Bible. The Baltimore Catechism for Confirmation review the Catholic sacraments, prayers, and Ten Commandments. They also add a closer study of the Holy Ghost and the Blessed Trinity. Baltimore Catechism No. 1 and Baltimore Catechism No. 2 usually cover the basic Catholic beliefs. Baltimore Catechism No. 3 simply goes into more depth. The Catechism Explained is the best Baltimore Catechism we have seen for adult Catholic religious education. It concurs with and expands upon the Baltimore Catechism No. 3 and the Catechism of the Council of Trent and is a one stop book. I love the Bible references, examples in the lives of the saints and the clear explanations it gives. I alos like to recommend reading the Bible as it makes for great spiritual reading. If you want to listen to it you can buy an MP4 or MP3 Audio Bible Douay Rheims Bible here. May God grant us all long and holy lives. Thank you for visiting!